Y&R Feb. Sweeps: Ashley, Ravi On the Go at Jabot? Y&R Feb Sweeps: Ashley & Ravi ~ Bollywood Supercouple? “The Young and the Restless” Executive Producer Mal Young spoke about what we can expect for the surprise coupling of Ashley and Ravi during February Sweeps! 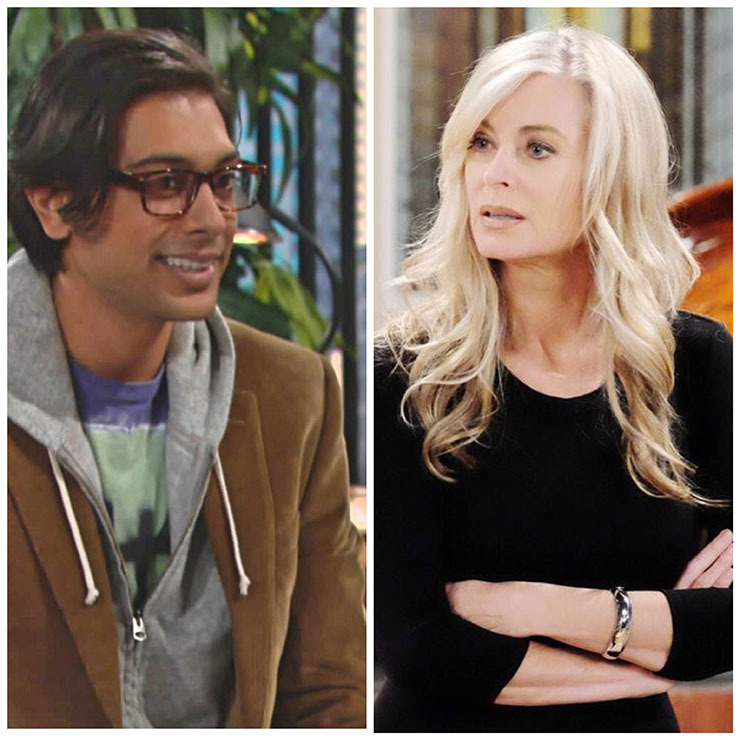 Ashley/Ravi: “Despite their differences, Ravi Shapur (Abhi Sinha) is enamored with Ashley Abbott (Eileen Davidson), and why shouldn’t he be? She’s an on-point and beautiful executive who knows how to take charge and that definitely has his attention. Ravi will contemplate taking a risk and try to grow closer to the boss he’s so smitten with,” said Young in the latest issue of “Soap Opera Digest,” (SOD). This week’s spoilers reveal Ashley will reveal a new side of herself to Jabot app guru Ravi. We at Soap Cities (SC) wonder what could that be??? So far, we have seen Ashley be very protective of Ravi, especially when Phyllis (Gina Tognoni) tried to woo Ravi to Fenmore’s. Now that Jabot has a major non-controlling interest in Fenmore’s, it will be interesting to see how Ashley shares her Ravi with Phyllis! However, it is obvious to everyone (including Ashley) that Ravi has a big crush on his boss. How it turns out will be anyone’s guess. We are talking about a smart, nerdy engineer making moves on a very smart, sophisticated, seasoned–and very wealthy–woman! But we can’t wait to watch Y&R during February Sweeps to find out! We also applaud Y&R Executive Producer Young for casting a South Asian actor and bringing diversity to Genoa City. While the role may seem a bit stereotypical, it’s nice to see more shades of color on the show! Of course, we at SC are not surprised since Young was a former producer on the BBC Soap “Eastenders,” which reflects the diversity of working class England. Despite their cultural differences and age, we say they should go for it! Previous ArticleY&R February Sweeps: Nick and Chelsea–A New Romance?! Next Article B&B Feb Sweeps: Love Quinn-trangle!